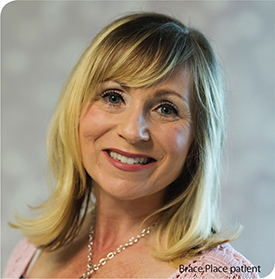 Brace Place is in the top 1% of Invisalign Providers—more than 3000 cases successfully treated! Invisalign has proven to be effective in both clinical research and in practices nationwide. More than half a million people are already smiling, thanks to Invisalign. Thank you so much for making my smile so perfect. The Invisalign process exceeded by expectations! I absolutely love my teeth and my great smile. Thank you Brace Place for being so professional. You have the most knowledgeable and competent staff which made my treatments so easy and very rewarding. Invisalign was the best investment, and it changed my life dramatically. My teeth are perfect. Thank you Dr. Epstein and the entire Brace Pace team for my amazing new smile. Thank you to everyone at the Brace Place. My new smile has given me more confidence. I am so happy and glad that I did it. At first, I was skeptical about whether or not to use plastic aligners to straighten my teeth, but I'm glad I decided to make the investment. In just about nine months my teeth were straightened using the clear, comfortable, and easy-to-remove aligners. I'm a busy guy, and using Invisalign fit into my lifestyle.